In 1852, Ye Kunhou went home to bury his mother. The filial son, then fifty years old, was at the prime of his career as a local official in the north China province of Henan, along the Yellow River. He had distinguished himself by fighting floods and then pursuing bandits and rebels. At a recent awe-inspiring audience in the capital, the emperor had commended him for diligent service. But the Confucian precepts of the imperial code required that an official resign his post for three years of mourning on the death of a parent. Together with his brother, he fulfilled his filial obligations by retiring to his home in the walled city of Anqing, to give his mother a proper burial. Anqing, on the north bank of the Yangzi River, lies about six hundred kilometers upstream from Shanghai at the river's mouth. In the mid-nineteenth century, it was the provincial capital of Anhui. A fairly new province, Anhui had been split off from the large lower Yangzi province of Jiangnan only in 1662 and given a name that derived from its two largest prefectures, Anqing and Huizhou-the latter lying south of the Yangzi and renowned as a homeland of Chinese merchants. Like other Chinese capital cities, Anqing was surrounded by a sturdy brick-faced wall, but the area within the wall measured only one square mile (2.5 square kilometers). With a population of perhaps seventy thousand, it was one of China's smallest provincial capitals. Commerce along this stretch of the Yangzi centered downstream at the port of Wuhu, and Anqing was primarily a political center-which was one reason scholar-officials like Ye Kunhou and his brothers moved there from the nearby village of their ancestors. Here they were close to official power and could enjoy the amenities of urban life: bookstores, teahouses, antique shops, picturesque temples and pavilions, and the company of their peers. A missionary in the early twentieth century reported that roughly one-fourth of the area within the walls was occupied by public buildings: the officials' yamen (as their combined office and living quarters were called), schools, jails, and temples. Anqing, in his words, was "a rather sleepy, conservative, comfortable place." In normal times, Anqing might have been sleepy and comfortable, but the mid-nineteenth century was not normal times. Indeed, no sooner had Ye Kunhou moved back to Anqing than the city found itself threatened by a massive rebel armada sailing down the Yangzi River. The rebels, known as the Taiping, were inspired by a quasi-Christian religious fervor (their leader conceived himself to be Jesus's younger brother) and an intense hatred of the China's Manchu ruling elite. The rebellion would wrack central China for over a decade, killing tens of millions and bringing unprecedented devastation. It was a watershed in China's modern history, but a cataclysm long in the making. The Manchu dynasty, called the Qing (pronounced "ching"), had been ruling China since 1644. During the first two centuries, the country had enjoyed unprecedented prosperity. Long years of domestic peace, the spread of new subsistence crops from the New World (especially corn and sweet potatoes), commercial crops (cotton, peanuts, rapeseed, sesame), the handicraft production of silk and cotton textiles, an efficient market in grain, and a state-supported safety net of granaries provided the foundations for this prosperity. Famine relief in bad years meant that most people had enough to eat, clothing was relatively cheap and widely available, and young men could afford to marry and raise families. As a result, China's population tripled, approaching 450 million: growth that was initially a sign of prosperity but ultimately a demographic burden. The Qing state did not keep up with this economic and population growth, its revenues limited by a 1712 edict freezing the all-important land tax. Corruption spread, and officials covered up problems they were ill equipped to solve. When dikes and waterworks were not well maintained, floods became more serious. By the nineteenth century, the granary system was plagued by leaky warehouses, rotting rice, and false reporting: an efficient state response to famine was no longer possible. Not long before he returned home, Ye Kunhou wrote a sad poem describing repeated floods in Anhui that left nine in ten people destitute: beggars filled the roads, people ate bark and weeds, and parents sold their children. The Qing state faced another problem-one scarcely mentioned in official documents. The Manchus were an ethnically alien conquest dynasty. From their homeland in the Northeast, they had conquered China in the seventeenth century. In some places, the conquest was extremely brutal, especially when Chinese men resisted the imposition of the Manchu hairstyle, which required them to shave their foreheads and keep a long braided queue. The conquering armies, organized in banners and including Mongols and ethnic Chinese (Han) from the Northeast, garrisoned key points throughout the empire, living in separate walled compounds. In the central government, every board (ministry) had two presidents: one Manchu and one Chinese. In provincial posts, Manchus and Han bannermen, descendants of the original allies, predominated. Over time, the cultural differences between Manchus and Han gradually faded. Despite vigorous imperial efforts to define and maintain a distinct Manchu identity, the bannermen acculturated to the Chinese environment. By the nineteenth century, Manchus wrote and spoke in Chinese, educated their children in the Confucian classics, composed poetry, and absorbed the cultural norms of the Chinese literati. Their skills as horsemen and archers, which the Qing emperors promoted to preserve Manchu identity, declined markedly. Still, they were a separate and privileged elite, and resentment of their political dominance was natural. In the mid-nineteenth century, these domestic problems were exacerbated by European imperialism. Westerners had traded directly with China since the sixteenth century, buying silk, tea, and porcelain (known in Europe as "china"). In the late eighteenth century, the pace of trade picked up, especially as the English developed a taste for tea. Tea became Britain's prime Asian import. Heavily taxed (causing well-known problems in the American colonies), tea also provided invaluable revenues for the crown. But the British were unable to identify an export product to balance their imports of tea, silk, and china-until they began cultivating opium in India. The trade was illegal, but the Qing state, whose navy was inadequate to patrol its long coastline, proved powerless to stop it. In the nineteenth century, and especially in the 1830s, opium sales increased dramatically until silver-which had long flowed into China to pay for Europe's purchases-began to flow out. This brought a shortage of silver, a fall in prices, and a significant economic downturn. In addition, as is always the case with illegal drugs, the profits from opium sales were sufficient to corrupt the Chinese armed forces and officials in the coastal regions. In 1839, the crisis came to a head. Determined to stop the opium flow, the emperor sent an imperial commissioner to Canton (or Guangzhou), the exclusive southern port for trade with the West. The commissioner closed opium dens, confiscated opium pipes, and punished addicts, and then sought to sanction the Western opium merchants. The British merchants persuaded their government to use the dispute as an opportunity to forcibly "open" China to trade. Soon the Opium War broke out. China's armies, neglected during long years of peace, were utterly unfit to confront this new challenge. In Ye Kunhou's words, "Half the soldiers on the registers are phony names [a padding of the rolls to enrich the officers]. / The old and the weak inherit their positions. / Men are drafted from the riff-raff of the towns and worthless rascals join the ranks." The superior discipline, training, tactics, and military technology of the British Navy and its marines won a quick victory, sealed in the 1842 Treaty of Nanjing. Hong Kong was ceded to the British; several ports, including Shanghai, were opened to trade and Christian proselytizing; and the Qing suffered a humiliating defeat at the hands of the Western barbarians. In one of the world-shaping tragedies of modern history, China and the West confronted each other politically and militarily just at the point when the Qing empire was growing corrupt and entering a period of decline while the West, bursting with confidence from the advances of the scientific and industrial revolutions, was more convinced than ever of the superiority of its civilization. The Opium War that resulted from this fateful confrontation exacerbated the decline of Manchu rule. Unrest had been spreading for some time, in the form of banditry, secret societies, and small-scale rebellions by religious sectarians, ethnic minorities in mountain enclaves, and underemployed, unmarried, and rootless young men drawn to gambling and criminal activity. Opium smuggling provided new opportunities for secret societies, and British efforts to suppress piracy along the southern coast drove many brigands into inland waterways. Amid this growing unrest, a frustrated scholar from the Canton region, who had repeatedly failed the civil service examinations, came to believe-after reading a Christian pamphlet-that he was the son of God and the younger brother of Jesus Christ. In the 1840s, Hong Xiuquan and a small band of devoted followers formed the God Worshippers Society in the ill-governed hill country of Guangxi province in southwestern China. Leaders of the God Worshippers, claiming to be possessed by the spirit of Jesus Christ or the Heavenly Father, offered prophecies, denounced immoral practices, cured sickness, succored the needy, and promised salvation for the faithful. The gentry elite in nearby towns became suspicious of this heterodox faith, reporting the group to the local authorities and harassing it with militia forces raised from their tenants and neighbors. But the God Worshippers attracted more and more followers, especially among the Hakka minority to which Hong belonged, poor charcoal burners and unemployed miners, other vulnerable groups seeking protection and support, and secret-society members willing to offer their fighting skills. By 1850, the government had grown sufficiently suspicious to move against this new religion, which reorganized itself as the Taiping ("Great Peace") Heavenly Kingdom and rose in open rebellion. The Taiping added a clear anti-Manchu message to its religious millenarianism. The Manchus were decried as alien "imps," and the Taiping displayed their anti-Manchu mission by abandoning the Qing-mandated hairstyle and marching forth with unshaved foreheads and loose tresses, which earned them the name "Long Hairs." For two years, the rebels fought and gathered strength in their southwestern hill-country base. Then in 1852 they broke out of government encirclement and headed north into central China, where the size of their army increased exponentially. By the end of the Chinese lunar year, the Taiping had captured the strategic cities of central China, and their vast fleet lay poised to move down the Yangzi toward Anqing and China's economic heartland in the lower Yangzi valley-down toward the ancestral home of the Ye family. Back in Anqing, Ye Kunhou and his family mourned his departed mother. Neighbors came to console him, but after a while, the number of visitors declined, and he regretted his loss of official status: "When one's time comes, guests are plentiful; / When one's influence wanes, even relatives are distant." He attended to family affairs-notably plans to build a proper lineage hall and compile a new edition of the genealogy. As the family's first official in many years, he was eager to establish the written record and ritual institutions that would preserve his family's place in local society. He also relished the opportunity to relax, away from the cares of office. He had returned from Henan with an enormous collection of some 460 antiques; old friends still came to chat over wine and poetry, an important form of socializing among the literati; and he had a substantial library where he spent a good deal of time reading history, turning often to accounts of earlier dynasties in crisis. The rebel advance was never far from his mind, and the city's lack of preparation distressed him. "From the walls, the sound of war drums; / Within the city, they are singing and dancing." When disaster struck, it seemed appropriate and inevitable retribution: "The prosperity of Jiangnan [the lower Yangzi region] has reached the level of arrogant extravagance. / Out of such peace and happiness comes sudden change. / The flames of war foretell a disastrous punishment." The advance of the Taiping armada along the river toward Anqing sent the city into an uproar. Strange omens foretold trouble: clouds without rain on a particular day, pear trees bearing melons, bamboo flowering across the city, rats fleeing, a falling meteorite. Such portents suggested that the dynasty had failed to maintain cosmic harmony and was losing the Mandate of Heaven. The populace was growing uneasy. After the fall tax collection, the city's granaries were filled with rice, which the governor feared would be an attractive target for the rebels. Additional troops were requested to defend the city, but when two thousand soldiers arrived from neighboring Zhejiang province, Ye Kunhou's son Boying was not impressed: they were "short, small, timid and weak-most unreliable." The governor sought help from the gentry-the local elite of former officials like Ye Kunhou, scholars who had passed the civil service examinations but never taken office, and other gentlemen whose wealth and status made them leaders of their communities. Ye Kunhou was asked to apply his experience fighting rebels in Henan to organize a local militia to defend the city. He responded by forming a gentry-led militia bureau, which first sought to identify Taiping spies who had infiltrated the city. He had little confidence in the governor, whom he found hopelessly weak: real power lay in the hands of the lieutenant governor, who in turn relied on an aide whose arrogance was unconstrained by moral principles. Ye Kunhou had good relations with another local official, the son of a colleague he had known in Henan, but this lower-ranking official could offer little help. With the official establishment in disarray, no one thought the city could be defended, and residents prepared to flee. One commander, fearing that Taiping soldiers might use the dwellings along the outside of Anqing's walls to scale the walls or to protect sappers digging tunnels to blow up the city's defenses, ordered the houses destroyed-a desperate (though prudent) move that both angered and frightened the residents. Officials and gentry retreated to the relative safety of the countryside. The young Ye Boying took his large extended family by boat some fifty kilometers north to the hills of neighboring Tongcheng county, where a former official and colleague of his father offered refuge. Back in the city, Chinese New Year came without celebration. Snow covered the ground. The markets were still. Most of the people had fled. Some four hundred kilometers upriver, on the first day of the Chinese New Year (February 8, 1853), the Taiping set forth from the central China city of Wuchang. A large ground force on both sides of the river protected a flotilla of some twenty thousand commandeered junks. In the middle of the fleet, the Taiping Heavenly King Hong Xiuquan rode in a majestic dragon boat, testifying to the imperial ambitions now added to his religious mission. The rebel army was virtually a nation on the move-perhaps five hundred thousand people in all, males and females in carefully segregated camps. Many were conscripts from the towns and cities the Taiping had already conquered, and not all would prove loyal to the cause. The immediate effect, however, was to produce such a massive force moving relentlessly down the Yangzi that resistance crumbled in city after city. Two weeks after the Taiping departed Wuchang, boats filled with refugees appeared on the river beyond Anqing's walls. Rumors flew that rebels were hidden in their midst. At dawn on the twenty-fourth, hundreds of rebel boats assembled on the south bank, opposite the city. The Qing defenders bombarded them with 189 antiquated cannons until the guns became too hot to take powder without exploding. Then the Taiping crossed the river and massed under the walls. The soldiers on the ramparts lowered themselves down ropes on the inside of the walls and fled. In the afternoon, the rebels scaled the walls, their war cries scattering the remaining defenders in chaotic retreat. The governor, hearing that the defenses had been breached, sent a final urgent report to the throne, then went to meet the enemy, who cut him down on the spot. The lieutenant governor took responsibility for safeguarding the tax revenues and grain, but as the rebels advanced, he fled for his life, abandoning the grain and treasure, which immediately fell into Taiping hands. The Ye men and other members of the gentry who had remained in the city first sought refuge in their homes. Late in the evening, a family servant reported that Anqing's north gate was open and still without rebel guards. Ye Kunhou fled the city with his son and brother, resting briefly at the home of a relative in a nearby village. Then the men struggled on through the night, crossing new snow and muddy fields, until they reached the rest of the family at dawn. The larger family, including wives, children, concubines, and servants, numbered forty people, and it took days to determine that all were safe. The joy of their eventual reunion was mixed with deep anxiety about the future. The countryside was full of soldiers who had fled the rebels. At first the villagers treated them as bandits and drove them off. Their will to fight utterly broken, the soldiers begged for mercy, and the peasants gave them pan bread and a little money to send them on their way. For the next couple days, rumors flew that the rebels were moving out to control the countryside. The gentry organized militia to defend their own villages. Then four days later, the Taiping simply abandoned Anqing and moved on downstream toward Nanjing, which they quickly captured and made their capital for the next decade. Ye Boying and his uncle returned to Anqing, where they found their home and its contents undisturbed. The market had been destroyed, and a few nearby homes were still smoldering; the treasury and granary were bare; temples that offended the Taiping's new god had been ransacked, their monks and priests slaughtered. Otherwise, the city looked much as it had before. The gentry organized men to dispose of corpses and put out fires. Once the rebels were gone, a new batch of officials and troops arrived, bringing relief grain for the poor, and a hurried attempt to restore order ensued. The respite would not last long. In June, the rebels returned. As usual, rumors preceded their advance. Roving bands of defeated soldiers disturbed the villages and towns along the river. Finally, a rising cadence of cannon fire (at first mistaken for thunder) announced the Taiping arrival. Again the Qing forces put up no defense, their officers retreating and soldiers melting away. The city residents fled in panic, but the gates had been partially blocked as part of the defensive preparations. As the fleeing mob pushed through, the old and weak and women and children fell and were trampled to death. Bodies piled up, belongings were abandoned in the road, and those behind simply climbed over the piles of death and debris. The Ye family members who had returned to the city joined in the flight. Ye Kunhou's feet were hurting, and when he was unable to continue, his son carried him on his back. They fled again to their relatives in the suburbs; then, as a storm broke out, they struggled through the rain-the women weeping and children crying-to seek refuge with friends farther out in the countryside. Looking back, they saw flames rise above the city. Once again, the Taiping left soon after taking the city. Two days later, Ye Boying was back in Anqing with an uncle and a reliable servant to check their home. They arrived just in time to scare off looters taking advantage of the disorder. This time the city had been thoroughly plundered, the city gates and official yamen had been burned, and bodies lay everywhere. Victims of battle and those trampled in flight lay rotting in the streets; those (mostly women) who chose suicide over capture by the rebels were found at the bottom of wells. With officials and army gone, bandits and rebels moved freely along the river, but few paid much attention to the city. It had been picked clean. "Who would have thought," asked Kunhou, "that this prosperous place would suddenly become a war zone? ... The destruction of war darkened the deserted city." Ye Kunhou decided that his family too must abandon the city that had been its home for generations. He ordered his son to salvage their valuable possessions, including a library of some ten thousand volumes and hundreds of antiques. For the next few weeks, Ye Boying traveled back and forth between the city and friends' homes in the countryside, moving clothes, books, and artwork to safety. None knew at the time, but this would be the final departure from Anqing for this branch of the family. During the summer, Anqing sat in limbo between the imperial and rebel forces. Local gentry appeals for the return of the provincial government and imperial troops were unavailing. The Qing armies remained in the central part of the province, between another group of rebels, the Nian, in the north and the Taiping in the south. The Yangzi River was essentially controlled by the Taiping, and their boats often stopped at the city. In October, the dashing young Taiping commander Shi Dakai arrived to establish his headquarters in Anqing. Only twenty-three years old, Shi Dakai was the scion of a wealthy family of early Taiping supporters in the southwest. One of the rebels' ablest generals and a capable administrator, he organized a stable regime in the region around Anqing. The Taiping had earlier promulgated regulations calling for the equal distribution of land rights, an egalitarianism inspired both by Chinese classical models and the Christian notion that all are equally the children of God. But this sort of revolutionary program apparently was never carried out, and Shi Dakai went out of his way to work with local landowners, protecting their property in exchange for ready payment of taxes. The relatively pragmatic policies of Shi Dakai affected the situation in the countryside where Ye Kunhou and his family were hiding. On the national level, the Taiping Rebellion represented a fundamental challenge to both Confucian orthodoxy and alien Manchu rule; but on the local level, two regimes competed for legitimacy and resources while the rural population maneuvered to minimize its losses from the struggle. With its own army in utter disarray, the Qing relied increasingly on gentry-organized militia to support its rule. The Taiping regime, in contrast to the "peasant rebellion" of conventional accounts, was based in the cities. When Taiping functionaries moved into the countryside to collect taxes, they pursued the gentry or militia-organizing households with particular ferocity. Because the Ye family included both former officials and militia organizers, the locals generally avoided any contact that might implicate them in anti-Taiping activities. But some local dissidents (the family termed them "bandits") saw opportunities to lead Taiping forces to gentry families in hiding and then rob them of their possessions. Ye Kunhou was surprised that these "short-sighted people" would "willingly become rebels." The family was forced to move to ever more isolated villages, until finally it sought refuge in a small hut that barely kept the rain out, deep in a gully below the cliffs of Sleeping Dragon Mountain some fifty kilometers north of Anqing. The rebels controlled the main thoroughfares, but none ventured near this refuge in the mountains. Indeed, the hills became the gentry's main redoubt, and the hideout was safe enough that dozens of relatives sought shelter with the family, and Kunhou's wife welcomed and cared for them all. The calamities brought by Heaven must be resolved by men. It is not possible that there is no one up to the task. Frustrated by their lack of credentials. Why can special talent not be found among scholars? It was Wang Yangming [a famous Ming dynasty philosopher] who pacified the Yao rebels. The reference to Wang Yangming is particularly interesting, for Wang was an idealist philosopher whose critique of some of the more rigid and conservative tenets of Confucian philosophy was often blamed for the decline and fall of the Ming dynasty. On this occasion, Ye Kunhou chose to remember his service as a successful provincial official who had quelled ethnic rebellion in southwest China. Resolve disputes and bring benefit to the entire lineage. Dispel troubles and bring harmony to your in-laws. In flight from rebellion, we deepen our relationships. In the barren hills we bond with our neighbors. I have left the city behind to enter this rural hamlet. The forest is so thick, what need is there to lock the door? The mountain water has the taste of licorice and sugar. My ambition for fame and fortune is now cut at the root. When poor I wish to sell my books by the thousand. When happy I down wine by the bucket. Though he probably did sell many books and antiques to support his large family, he kept enough books to read and enjoyed discussing them with his brothers. Other literati in the area, gentry members and former officials, visited to share news and concerns and to cultivate companionship. On his wife's birthday, he borrowed wine from a neighbor to celebrate. In the end, however, Ye Kunhou's Confucian sense of duty precluded a life of Daoist escape or bucolic exile in the hills. Early hopes that imperial resolve would produce a quick victory gave way to anger at successive military failures. In battle, the officers are in the rear. As soldiers advance, who is to lead them? In flight, the officers are in front. When the ranks collapse, who is to restrain them? Far from stopping them, [the officers] lead them in flight. The officials do not defend the cities-the rebels do. Ye's previous experience fighting bandits in Henan had convinced him of the efficacy of militia systems built on the classical model in which soldiers lived among the people. In antiquity, he wrote, everyone knew how to fight, and people fought for their country as for their family. With soldier and peasant roles now separated, ordinary people had become afraid of battle and viewed defense against disorder as a responsibility of soldiers that had nothing to do with them. The army, for its part, was filled with unfit soldiers and worthless rascals who never attacked the enemy but only harmed the people. The appeal of local militia was founded on their capacity to harness peasants' natural desire to protect their homes and families to the security interests of the state. At the time of the Opium War, exaggerated stories of militia victories over the British in the villages around Canton renewed people's interest in militia organizing in the 1840s, and gentry-led militia became critical to Qing efforts to combat the Taiping and other rebellions. Ye Kunhou's commitment to militia organizing was enhanced by the sense of community that he imagined linking literati like himself to the peasants in the Anhui hills. His experience in this rural exile had convinced him that literati could and should lead a response to rebellion that rested on different principles from the perceived estrangement between the regular army and the people. He committed himself to organizing resistance to the rebels. In the winter of 1853, with a cold wind blowing through ice-covered trees, Ye Kunhou and a single servant left his family to head toward the Qing lines to the north. Armed only with a wooden staff and wearing a short jacket instead of the long gown of a scholar, he traveled through mountains and across icy streams to reach the camp of Yuan Jiasan, the imperial officer commanding the effort to recover Anhui. Though himself a former official, Kunhou had to plead outside Yuan's gate for three days before receiving permission to organize a force to retake the area around Anqing. His younger brother, Ye Lian, headed west at the same time to persuade another official that the people of Anqing were not, as many believed, obedient subjects of their Taiping rulers. Taiping taxes were heavy and much resented, he argued, but the people feared the rebels' overwhelming power. If an army could be raised to challenge the insurgents, the people would rally to its support. So Ye Lian was sent back with authority to organize a militia force. With another brother, Ye Yun, he visited relatives and friends to rally resistance to the Taiping. One day, as the two brothers emerged from a gentryman's home, they encountered two mounted Taiping soldiers coming from Anqing. The brothers' shaved foreheads and queues aroused suspicion, for in rebel-occupied territories, most peasants now wore their hair long in the Taiping style. The brothers claimed to be visiting from outside the province, but the soldiers did not believe them. A search of Ye Lian's gown uncovered the letter authorizing militia organizing. Fortunately, the rebel soldiers were illiterate, but they took the letter and left Lian in the hands of a local Taiping official, promising to take him to the Taiping capital for trial on their return. The Taiping official was a local man, clearly distinguished from the main rebel force in Anqing. His ambivalence about his position was palpable. He collected taxes and managed local affairs for the Taiping, yet feared them as a powerful outside force with strange customs and heterodox beliefs. Perhaps he sympathized with the gentry militia but worried that it would only bring trouble to his neighborhood. So he temporized, unwilling either to release Ye Lian or turn him over to the rebels for almost certain execution. Ye Lian's friends visited him in confinement, some of them counseling suicide as preferable to a dismal fate in Taiping hands. Meanwhile, the young Ye Boying pressed on with the militia organizing, giving a dramatic speech to a gathering of rural gentry leaders. He noted the brave sacrifice of his family. His uncle had been captured, and the secret of their militia organizing was out. "In the effort to save many, he has brought disaster on himself. You should be moved." He vowed to continue resisting the rebels. His father had gone seeking assistance from the Qing armies in the north. "Fathers and sons, uncles and nephews should devote their lives to the cause. Now I intend to move my family to safety in order to preserve our bloodline. I will stay behind, and if the rebels come looking for me, please turn me over to appease them and you can avoid implication." But he coupled this bold self-sacrifice with a stern warning: "If out of fear of the rebels you should bring harm to my family, when the great Qing army arrives and learns that you have killed others to curry favor with the enemy, your entire families risk execution and it will be too late to repent." Ye Yun, brother of the captive Ye Lian, took another tack. Scrambling through brush in the middle of the night, he visited a wealthy and talented local notable who had been pressed into service as a Taiping officer. The man said he could do nothing to help but in fact devised a plan to accomplish the rescue. He secretly passed word to the ambivalent functionary holding Ye Lian, suggesting that he send Lian to Anqing before the Taiping soldiers returned with the incriminating document. The official did so, and in Anqing, Ye Lian's captors informed the Taiping authorities that they had captured a man with shaven hair and a queue who appeared to be a merchant returning home. They guaranteed that Ye Lian was sincere and without Qing contacts, and he was released. Ye Boying gives a more dramatic, but less plausible, version of his uncle's release. He has Ye Lian bravely scorning any threat to his life and proudly announcing that his family had been gentry and officials for generations and knew the meaning of loyalty. "The slice of a knife or a boiling cauldron would be like a tasty meal to me." A Taiping soldier immediately advanced to cut him down, but the officer in charge stepped forward to say, "What's the use in killing this stupid scholar?" and Ye Lian's life was saved. Ye Boying's account of his time hiding from the Taiping is presumably more reliable. In 1854, he was twenty-nine years old. He had married at nineteen, the same year he passed the examination for the lowest (shengyuan) degree. He had one five-year-old son and had spent much of his adult life supporting his father's official career. When Ye Kunhou left to join the Qing military, he instructed his son to look after the family and his collected poems. This instruction was probably a fair indication of Ye Kunhou's priorities, and for several years, Ye Boying moved his family from one hilly hiding place to another, paying particular attention to his father's poems and his mother's health. Following the detention of Ye Lian, the family felt more endangered than ever. The Taiping were aggressively scouring the countryside for gentrymen organizing opposition to their rebel regime. As Ye Boying moved his family from place to place, he was convinced that local rascals who had heard of his uncle's capture were watching family members' every move and plotting to turn them in. To ensure that some members would survive discovery, the family split up. Following his release, Ye Lian returned to western Anhui. His brother, Ye Yun, and his immediate family were in one village; Ye Boying lived alone in a second; and his mother lived in a third. Boying's account is notably silent on where his wife and child stayed, but they were presumably with his mother. Following the Confucian obligation to bid a parent goodnight, Ye Boying traveled after dark to his mother's hiding place, stumbling along by moonlight on clear nights and carrying a lantern when skies were overcast. Servants accompanied him, carrying food and provisions. When the dogs barked on their approach, his mother would come anxiously to the window to greet him. Entering the house, Boying would bow reverently to the old lady, then chat deep into the night, returning to his own village only after she had fallen asleep and arriving barely before dawn. Even if his account of this nightly ritual appears self-serving, it shows a close bond to his mother. One snowy night in the winter of 1854-55, Ye Boying answered a knock on his door. His father's personal servant came in, bearing a message that Ye Kunhou was second-in-command of a major force seeking to retake Tongcheng, the county just north of Anqing. Soon the family learned that the Qing army had laid siege to the city. From their hiding place in the mountains, Ye Boying and the others could hear the distant rumble of cannon. There were rumors of a great Qing victory, but a low-ranking Anqing gentryman who had joined the Taiping cause managed to ambush the Qing force from the rear; then Shi Dakai, the Taiping leader in Anqing, brought reinforcements to break the siege, killing the Qing commander and routing his forces. Anxious about his father's fate, Ye Boying set forth by back roads and mountain trails until he heard his father was safe. Eager to join the campaign and advance his own career, he sent a message to his father. Two days later came the response: Kunhou had reassembled half of the defeated army and was heading north to regroup. Boying was to look after the family and wait on his mother. "I must fulfill my obligation of loyalty [to the dynasty]; you must fulfill your filial duty." Boying was now almost thirty years old, but in this family's Confucian division of labor, the father assumed responsibility for public service while the son stayed home and cared for the family. In the spring of 1855, after two years hiding in rebel territory and holding little hope that the Qing would soon reconquer the area, the family decided to flee to Shaanxi province in the northwest, where Boying's brother held an official position. Though the brother's appointment was only as county magistrate in a poor province, the post represented a critical Ye family foothold in officialdom. His father had made every effort to stay in contact, with one letter taking a year to reach the family in the Anhui hills, but Ye Kunhou's message to this son was clear: "The whole family is hungry. / This [your] small office is very precious." Whether his son in Shaanxi offered financial assistance to the family in Anhui is unclear, but he was able to provide refuge from rebellion, and by 1855, the family was ready to move. The first part of the journey was entirely through rebel territory. The group traveled by back roads, and as there were no inns, sent servants ahead to prepare resting places. The family was too large to travel together without arousing suspicion, so it divided into three groups. Boying's mother was ill and coughing blood, but she insisted on leaving. After ten days, the family reached the Qing lines, and the old lady told her son, "Since leaving rebel territory, a thousand-ton weight has been lifted from my body. Finally I am able to eat and sleep normally." But when Boying looked back to the south, the smoke of signal fires filled the sky, and he worried about friends and relatives still hiding behind rebel lines. Once safely out of Taiping territory, the family again split up. Uncle Ye Yun headed for Beijing, planning to take a special examination that might bring an official posting. The others traveled by boat and cart, first west and then north, through Henan, where they rested in the yamen where Ye Kunhou had once served. At another stop, they stayed with an in-law who was also an official. Finally they moved west up the Yellow River valley and through a pass into the valley of the Wei River to Xi'an, site of China's ancient and medieval capitals. Boying's brother greeted them, and the family was briefly reunited before the provincial governor sent the brother off to assume his magistrate position in northern Shaanxi. The family members had survived the Taiping Rebellion, but not without considerable trauma. Their home in Anqing lay in ruins, and most of their possessions had been lost. Hiding in the hills for two years brought hardships that this elite family had never before experienced. Anqing would remain in Taiping hands for eight years and become the strategic point for which the armies fought to control access to the Taiping capital in Nanjing. In the final battle of 1861, sixteen thousand people were killed in the Qing assault, many if not most of them civilians. From Anqing, the Qing forces methodically mopped up the remaining rebel forces in Anhui. Three years later, the Taiping capital would fall, and China's bloodiest civil war would end. When one Ye descendant returned to Anqing after the rebellion, he found only scattered thatch huts among the desolation. "Only one in a hundred survives from the older generation," he was told. "The able-bodied adults have all fled, we know not where. The young who are left do not even know their own names." With the family's most eminent members elsewhere, the Anqing Ye had lost their prominence. Those who remained were mostly ordinary peasants, struggling to survive in the wreckage of rebellion. Ye Kunhou and his descendants never returned. Although his line was driven from the Ye ancestral home, its members fled as well-connected players in the official elite. For them, and especially for Ye Kunhou and Ye Boying, the rebellion provided an opportunity for distinguished official service, which was the road to wealth and power in late imperial China. We shall turn to their official careers shortly, but first we must examine the roots that had nourished the Ye family's rise. Ancestral Leaves follows one family through six hundred years of Chinese history and brings to life the epic narrative of the nation, from the fourteenth century through the Cultural Revolution. The lives of the Ye family—“Ye” means “leaf” in Chinese—reveal the human side of the large-scale events that shaped modern China: the vast and destructive rebellions of the nineteenth century, the economic growth and social transformation of the republican era, the Japanese invasion during World War II, and the Cultural Revolution under the Chinese Communists. 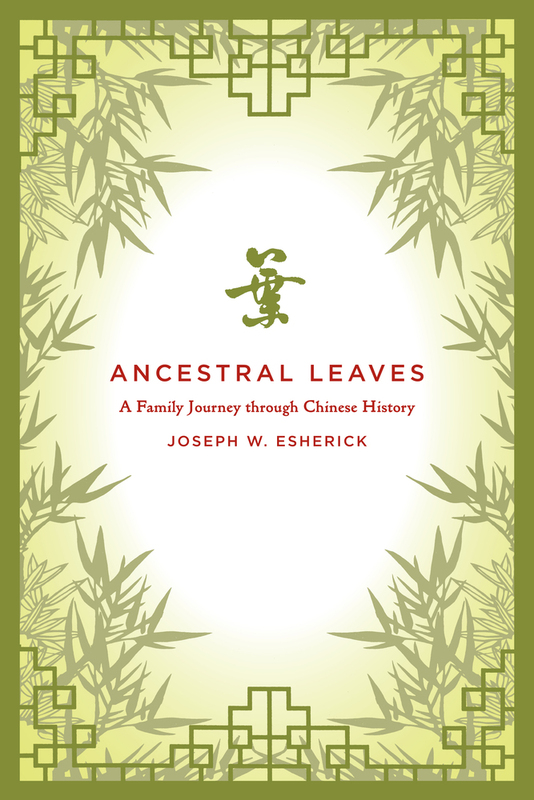 Joseph W. Esherick draws from rare manuscripts and archival and oral history sources to provide an uncommonly personal and intimate glimpse into Chinese family history, illuminating the changing patterns of everyday life during rebellion, war, and revolution. 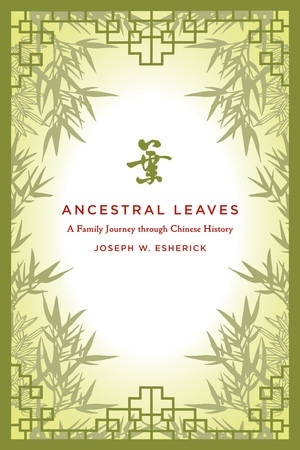 Joseph W. Esherick is Professor of Modern Chinese History at the University of California, San Diego. He is the author of The Origins of the Boxer Uprising (UC Press) and co-editor of The Chinese Cultural Revolution as History, among many books.